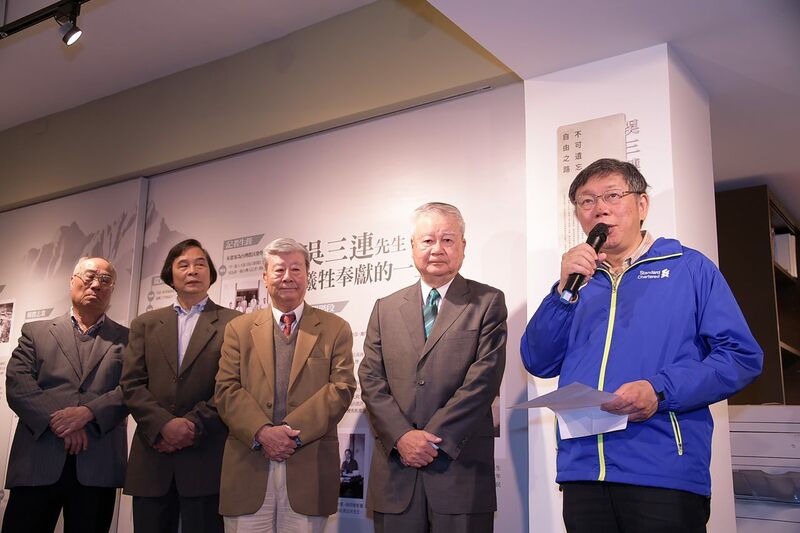 On April 3, Taipei City Mayor Ko Wen-je attended the Freedom of Speech Day memorial ceremony for the unveiling of Unforgettable Path of Freedom – Mr. Wu San-lien Memorial Monument. During his speech, Mayor Ko mentioned that April 7 has been designated as Taiwan’s Freedom of Speech Day; the freedom of speech has never been a given – it is something that many people have sacrificed and fought for, something that they have exchanged their blood and lives for. It’s no different in Taiwan, where the freedom of speech has never naturally occurred but has been earned through strenuous efforts. Taipei City Government has been organizing events since 2017 to commemorate the April 7 Freedom of Speech Day. Our first event was the Unforgettable Path of Freedom; last year it was the unveiling ceremony for Mr. Cheng Nan-jung’s memorial monument. And this year, we are gathering here to pay our respect to Mr. Wu San-lien. Mayor Ko pointed out that Mr. Wu San-lien had once served as government-appointed Taipei City Mayor in 1950. In 1951, he became the first Taipei City Mayor via direct election of the people. Today, the conference room directly across from the Mayor Office, located on the 11th floor of Taipei City Hall, still owns the name Wu San-lien Hall. We have specially reserved the conference room to commemorate this piece of history of our former Taipei City Mayor. The mayor emphasized that if we want to make Taipei into a more cultural city, we have to keep our history. He has reiterated the point many times – anything that has happened on this land would be a part of the history, and we would have to preserve and integrate it into our modern society. On this year’s April 7 Freedom of Speech Day, we are specially recognizing the Independence Evening Post founded by Mr. Wu San-lien. The newspaper was a unique presence during the period of authoritarian rule in Taiwan; besides underground flyers, Independence Evening Post was probably the only media that dared to comment on public policies. Mayor Ko said that the newspaper was popular during the time when he was still in middle school. He further acknowledged that Independence Evening Post had stayed unwavering during the time of authoritarian rule as it published critics on current policies and undauntedly expressed its views, with no signs of serving as the government mouthpiece. Under the leadership of Mr. Wu San-lien, the newspaper had carried out tremendous contributions to Taiwan’s freedom of speech. In light of this, we would like to take this opportunity today to honor Mr. Wu San-lien’s overall contributions to Taiwan’s development of freedom of speech.